Santiago (Chile). FARFAN. . vid. : 45 min. Who will feed us in a planet in crisis? “There is a need for strategies that lead to the revitalization of small and medium sized farms, and point the way towards the reshaping of the entire agricultural policy and food system in ways that are economically viable to farmers and consumers. 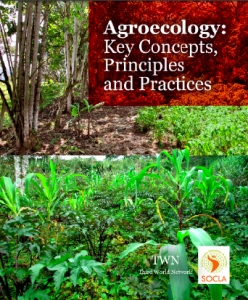 Currently proposed “sustainable intensification” in agriculture is ideologically buttressed by intellectual projects to reframe and redefine agroecology by stripping it of its political and social content and promoting the wrong notion that agro-ecological methods can co-exist alongside the aggressive expansion of transgenic crops and agrofuels. Many environmental and advocacy groups privilege those with access to capital and perpetuate an “agriculture of the poor for the rich”. The technological determinism that the organic agriculture movement emphasizes, through development and dissemination of low-input or appropriate technologies, is not only naïve but also dangerous, as it assumes these technologies in themselves have the capability of initiating beneficial social changes.